This is the 2nd stop on our trip to the Seychelles, Mauritius, and Paris. We arrived at the Grand Mauritian Resort and Spa to be greeted with a cool towel and a Grand Mauritian specialty drink (Passion Fruit, Rum, & Club Soda). We were directed to a sitting area overlooking the ocean and were quickly greeted by the General Manager. She introduced herself and inquired about our trip to the Indian Ocean. We had a nice chat and we learned she had recently left her job at the Le Meridien in Paris to serve as the General Manager of this brand new resort. The hotel was less than 60% occupied and had a large company group during the first part of our stay. As a result they were assigning guests to one end of the resort. The resort has two infinity pools. We enjoyed the one off to the right of the hotel as it provided more privacy. The beach was man made so we spent most of our time at the pools. The Italian restaurant Brezza was fantastic and waiters were very friendly. Each night we returned and they remembered our names. The last night we tried the Season restaurant which has food from different parts of the world including Thailand, Africa, French, and Indian. Upgraded at arrival to a balcony suite, the largest they had to offer. In our room were the goods, we were given two large bottles of Evian water, a bottle of red wine, a hat with the hotel logo for me, and a beach wrap w/logo for the wife. The first room had a bad mildew smell, and we were quickly relocated to a nearby balcony suite that did not have the same problem. We saw the GM the next day and she apologized for the first room informing us they had recently had a bad storm and some of the rooms had water damage. It had a large bedroom area, seating area and a flat screen TV. The bathroom was large with a walk in shower, Tub and his/her closets. The highlight of the room was definitely the balcony. A few days we watched the sun set from our balcony with glasses of wine from our free bottle of wine. The hotel is on the West side of the island and I believe the beaches on the East Coast or Southwest coast are nicer. 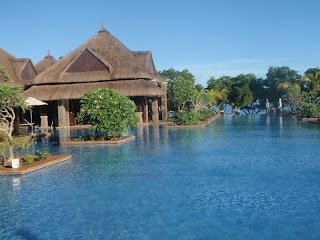 There was not much around the resort other than a few other hotels including another Starwood property the Le Meridien. 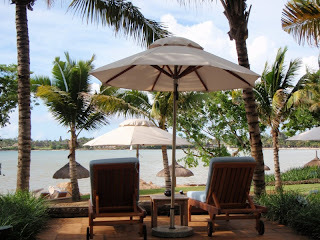 Overall we really enjoyed our stay at the Grand Mauritian.